A common query we receive at our Technical Office in Clay Cross is that the Roofing Contractor is having trouble welding the PVC membrane and that it must be a product issue! The problems generally range from the membrane just won’t weld or the quality of the weld is poor and blisters are forming within the overlap joint. In both cases the reason for the PVC membranes not welding are either due to inadequate membrane storage or inadequate membrane preparation. Good roofing practice states that PVC membranes should be stored in its original packaging and protected by an additional waterproof covering. The membrane should also be stored horizontal with full protection and be kept off the roof deck away from ponding or flowing water. All membrane laps should also be fully welded by the end of each working day after they are laid out. All PVC membranes when exposed to the elements will allow an amount of moisture to absorb into the micro pores of the membrane surface over a period of time. This moisture absorption inevitably results in a poor or inconsistent hot air weld if not removed. 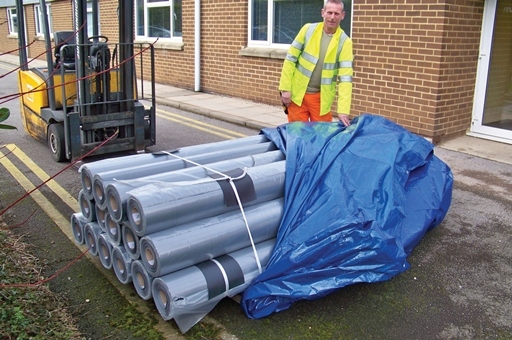 Membrane storage is often over looked during installion and the packaging is often considered by many as being sufficient protection against the elements, but the product packaging is there purely to protect the membrane whilst in the manufactures or distributors warehouse and during transportation to site. The packaging is not designed to protect the membrane from exposure to excessive moisture. When PVC membranes are exposed to excessive moisture prior to installation the moisture absorbs into the micro pores of the membrane surface. Typically PVC membranes weld at approximately 420°c and the absorbed moisture will turn to steam at 100°c. This steam then creates blisters within the overlap resulting in a poor or inconsistent weld. When examined more closely pitting is visible on the membrane surface within the blisters. 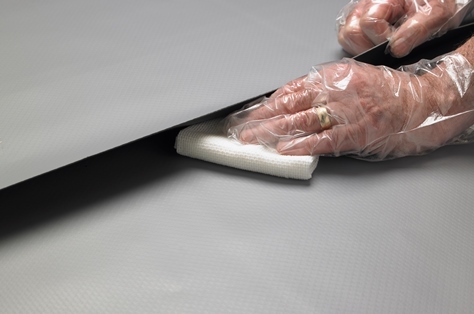 The only time PVC membrane lap preparation need not be considered is when the membrane is first rolled out onto the substrate having being correctly stored prior to installation. In all other cases it should be a consideration. The term “heavily soiled” should not only be associated with PVC roofs that are several years old, if the construction site is muddy and the roof is constantly trafficked especially during inclement weather it will not be long before the roof becomes “heavily soiled” and a cleaning & preparation regime should be adopted. 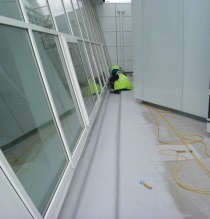 Another consideration even if the roof isn’t particularly dirty but it has been a prolonged period of wet weather prior to any remedial work taking place there will be a high possibility that moisture has absorbed into the micro pores of the membrane. This will need to be removed prior to hot air welding. To correctly assess the need and level off membrane preparation required a peel test should be first carried out between the soiled membrane and new clean membrane. Before the peel test the soiled membrane should be initially cleaned to remove any surface dirt by lightly scrubbing with hot soapy water, it is important to clean the area a minimum 100mm past the line of weld and allow the membrane to completely dry prior to the peel test, the drying time will depend on the weather conditions on the day. If the peel test fails then a more robust preparation regime will need to be used. The next stage of membrane preparation should be the use of a light duty solvent cleaner which will evaporate any light moisture absorbed into the very top micron layers of the membrane and lift any dirt out of the membrane surface pores. Solvent cleaners have been readily available over the years but it is always advisable to only use the solvent cleaners that are supplied or recommended by the membrane manufacturer. This will ensure that the solvent is suitable for its intended use and compatible with the membrane. Once the cleaned membrane has been prepared with the light duty solvent another peel test should be carried out. If this peel test fails then the next level of preparation should be considered. The final level of preparation would involve Acetone. Again you should only use the Acetone which is supplied or recommended by the membrane manufacturer. Not all Acetones are the same and there are recycled Acetones in the market which do not have the same level of performance. Not cleaning off the membrane surface dirt initially with hot soapy water. Wiping the soiled membrane in a circular movement which just moves any dirt around the membrane and not off the membrane. Not periodically replacing soiled cleaning cloths with clean ones which results in transferring the dirt back onto the membrane surface. Not allowing the solvent sufficient time to flash off which is just as bad as trying to weld damp or wet membrane. Using excessive amounts of solvent which will have an effect on the recommended drying times. 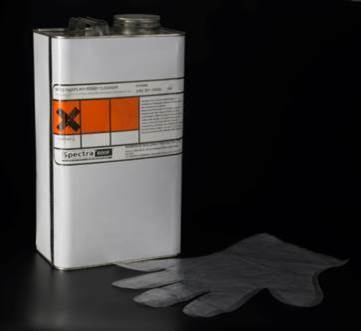 Acetone is an aggressive solvent that should always be considered as the last result. When applied to the membrane surface it physically removes the top micron layers of membrane. The membrane surface is then completely free from any moisture and dirt. One scenario when Acetone will struggle to work is if there is moisture above and below the membrane for a long period. This normally happens where membrane has been leaking close to gutters sections and outlets where ponding sometimes occur. The membrane will be completely saturated and will not be able to air. The only way you will get a consistent weld is by removing the water from above and beneath the membrane and allowing the membrane time to naturally dry out before using Acetone. Another option when not wanting to use a solvent cleaner is to position the repair under the existing membrane which in theory should be clean and free from moisture. This repair technique is only suitable on mechanically fastened of loose laid installations. The recommended application techniques and drying times of the solvents and Acetones should always be adhered too. This information will be found on the manufacturer’s preparation cleaner’s technical data sheets which will also advise on transportation, storage, PPE and disposal. 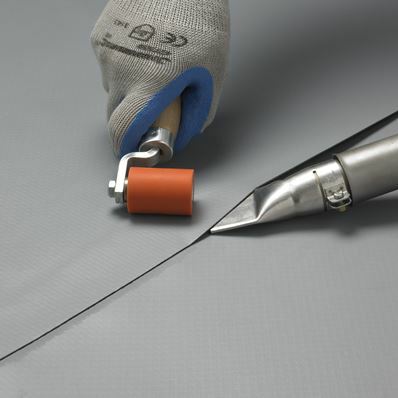 Any introduction of a solvent cleaner or Acetone onto the membrane surface will reduce the quality of weld when compared to a weld between two new clean pieces of membrane. In today’s environment we should always try to limit the amount of solvent we use within our systems. Following good roofing practice will help towards this.